LC 2015 - Why Buy Le Cache Versus Other Brands? Why Buy Le Cache Versus Other Brands? Le Cache wine cabinets differ from competitor wine cabinets in several important ways summarized below. Le Cache wine cabinets are built from premium materials, such as 3-inch thick doors with double-paned tinted glass windows. Rich cherry wood veneers on the exterior are finished with hand-staining and 3 layers of lacquer. Our moldings are hand-crafted from solid wood, included in the price of each piece. By contrast, other manufacturers typically have 1-inch thick cabinet doors and charge extra for cherry wood (oak is the standard) and for moldings. Le Cache exclusively uses cooling units made in the USA by CellarPro Cooling Systems, widely recognized as the leading brand of refrigeration equipment for wine cabinets and cellars. CellarPro cooling units are built with the most advanced components and technology, and come with an industry-leading 5-year warranty on parts and labor. No other wine cabinet manufacturer offers refrigeration by CellarPro. All Le Cache cabinets use self-enclosed, forced-air cooling units which can be easily removed from the cabinet and replaced if necessary. Not all manufacturers use forced-air systems. Some use standard refrigeration systems that are fully integrated into the cabinet—and therefore can't be swapped without replacing the entire cabinet. 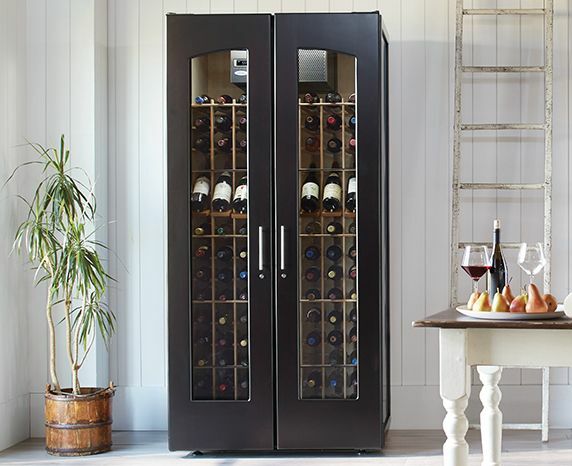 Le Cache upright wine cabinets offer a choice of fresh air intake from the top or the rear of the cabinet. If you choose the top intake configuration, you can place your Le Cache wine cabinet directly against the wall, provided that sufficient clearance exists above the wine cabinet. Most competing manufacturers' wine cabinets require 4 to 6" of clearance behind the wine cabinet, or charge extra for configuring their cabinets so that they can be placed flush against the wall. The racking in Le Cache wine cabinets offers 3.75" spacing in every slot. This sizing means that almost all 750ml bottles will fit inside the racking—including not only Bordeaux bottles, but also Burgundy, most Champagne, and even Turley Zinfandel bottles. Other manufacturers offer tighter 3.25" or 3.5" spacing and occasionally some (but not all) slots with 3.75" spacing. All Le Cache cabinets are protected by the best warranty in the industry: 2 years of protection for the wine cabinet and 5 years of coverage on the cooling unit. In addition, Le Cache offers an extended warranty that provides in-home service coverage on both the cabinet and the cooling unit for a full 5 years. Competing brands usually offer warranty coverage for 2 years on both the cabinet and the refrigeration system or 5 years of coverage on just the compressor (one part of a cooling unit). You can return a Le Cache wine cabinet for any reason within 30 days, no questions asked. Our goal is our customers' complete satisfaction. Many other brands or companies do not accept returns or have the same commitment to customer service. Questions about our cabinets? We're happy to answer. Give us a call toll-free at 1.877.532.2243 or ask us through a live online chat. You can also use our contact form.